Our Wonder World: blue plate special. Labor day I woke up hungry. 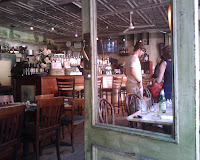 Never the fool, I went to via della pace for brunch, on the corner of 7th street and 2nd ave.
Who did I see there? 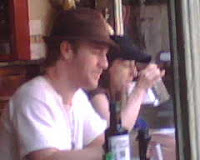 James Van der Beek from Dawson's creek. Mostly my bf was just annoyed that I pulled my phone out during brunch. Whatever. If you're gonna live in nyc, you're not gonna care about seeing celebs, but if you write a blog, you are. When I lived there, I kept a running mental list. It was sort of like birdwatching. Catch me a Hayden Christensen, huh?